The degenerated cells cause an inflammatory reaction and influence other blood cells with it so much, that the immune system is suppressed. They send out messages via exosomes, little bubbles, which the cells transmit to their surroundings. The discovery by the DKFZ scientists paves the way for new therapy approaches. Tumor cells influence their environment in order to avoid an immune response and to facilitate favorable conditions for growth. It has been known for a long time that solid tumors, those which grow as solid tissue inside an organ, manipulate macrophages, the 'big eater' cells of the immune system, for their own purposes. "Recently, we have seen more and more evidence that something similar must be happening in leukemia", says Martina Seiffert of the German Cancer Research Center in Heidelberg. So leukemia cells, acquired by the patient through CLL, could only survive in a culture cell if it also contains macrophages or monocytes, the precursors of the 'big eaters'. They serve as a form of nourishment for cancer cells. Seiffert's team has now discovered how the interplay between leukemia cells and monocytes becomes a catalyst for cancer development. "We know that the so-called PD-L1 receptor occurs more frequently on the surface of these nourishing cells, and suppresses the immune response", says Seiffert. "What we have here is a so-called immune checkpoint, which prevents excessive immune responses." In this case, however, the immune response is suppressed so much that the cancer cells can multiply unopposed. In addition, the monocytes send out semiochemicals, which belong to the inflammation response of the immune system and support the growth and multiplication of the cancer cells. The decisive question has been, how the leukemia cells can manipulate the monocytes in their environment. 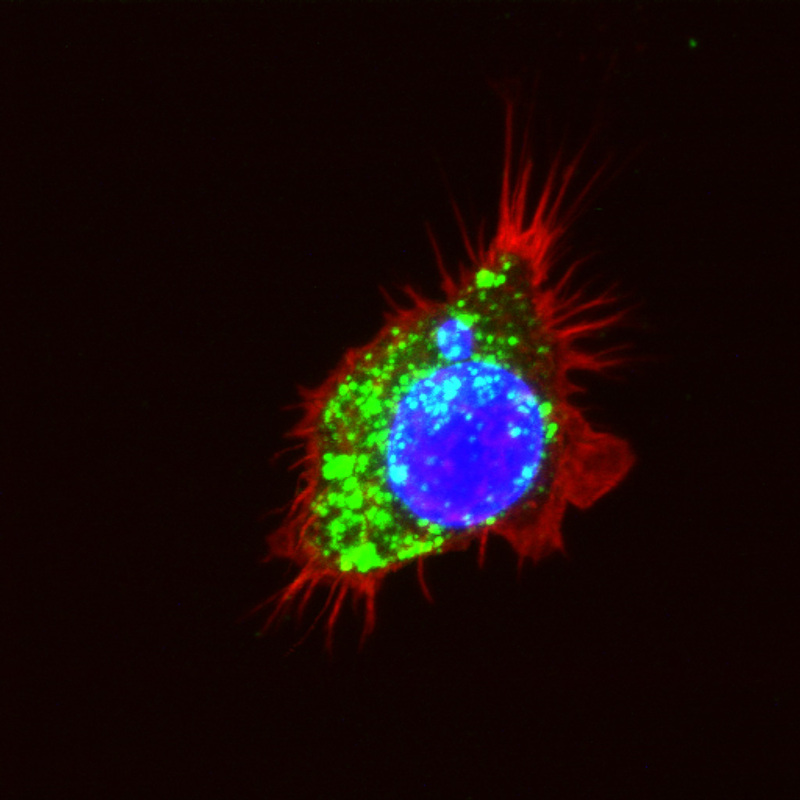 The scientists initially presumed that exosomes might play a role -- little bubbles which are transmitted from cells to their surrounding environment. They help cells communicate with each other and influence each other's behavior. The blood plasma of CLL patients does in fact exhibit a larger number of exosomes, which are sent out by leukemia cells. The analysis of these exosomes has shown that among other things they contain Y RNA. This is a class of short RNA molecules about whose function not much is known. In order to evaluate the effect of the Y RNA, the scientists treated monocytes and macrophages of humans and mice with suspect exosomes, as well as purified Y RNA from those exosomes, in a culture dish. In both cases the cells changed similarly to how they would in CLL patients. "They carry more PD-L1 receptors to their surface and emit semiochemicals which accelerate the immune response and create favorable growth conditions for leukemia cells", explained Franziska Haderk, principal author of the publication. Another discovery: The Y RNA message of the so-called Toll-Like receptors 7 and 8 (TLR7/8) is found in the monocytes. These serve to register foreign RNA, such as from pathogens, and to activate the immune response. At the same time, the activation of the Toll-Like receptors also strengthens the immune inhibitor PD-L1. "This creates an environment which supports the survival of the cancer cells and recruits cells of the immune system, but at the same time stops an effective response of the immune cells via the PD-L1", says Haderk. With this, the DKFZ researchers have at identified multiple new therapy approaches. In addition to a suppression of the PD-L1 receptor, it is conceivable to inhibit the recognition of the Y RNA message. "This could perhaps succeed by adding TLR inhibitors such as Chloroquin, a medication which is used for Malaria and rheumatic inflammation", explained Seiffert. In experiments with mice given CLL cells, the agent was able to markedly suppress the reproduction of cancer cells. "That makes Chloroquin an interesting candidate for a combination therapy along with other agents", said Seiffert.